Thanks to all who have written and contributed across the JH fan community during these hectic few weeks. Pussycat would seem to be one of Juliana's best received albums in recent years. Very special thanks once again to this site's contributor-in-chief Carlos Lopez for many of the links that have been posted. If you've missed David Young's photos, they're now all collected in the USA 2017 section. She kept her patter brief (and warm and heartfelt) between numbers Saturday night, launching relentlessly into non-stop fury and bared pain tempered occasionally with introspective numbers like the new “Wonder Why,” in which she revisited childhood dreams. “I wonder why the aliens who landed on the roof left me there / and didn’t take me to the sky,” she sang. Even if you couldn’t make out the lyrics, you could tell how honest, these songs were just by the passion and openness with which Hatfield sang, attacked her guitar, interacted with her fans. During the set Philips and Fisher provided a steady percussion session. Fischer sang back up on some of the songs. Hatfield and the band were very connected and they played off each other well. Since it was the first night of the tour fans got to witness some moments where the band had to change some things up and work some things out and it showed the authenticity and realness of who these musicians are. The band did not have a set list per say they were playing songs they loved and a variety of over the year tunes. 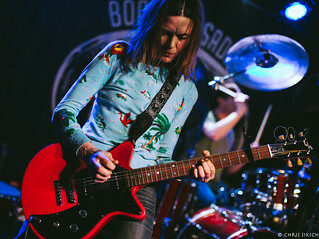 The Juliana Hatfield Three delivered a loud, sweaty and raucous show at the Boot & Saddle in South Philly last night. In fact, you could say it was a night of true grrrl rock (it is the Pussycat tour, after all). The 20-song set opened with a ferocious “Got No Idols” from Become What You Are. As evidenced by the video, Todd Phillips was a monster on drums, Dean Fisher equally brutal on bass and Juliana – well, Juliana was Juliana, full of grace, grit and growls on guitar and vocals. The band covered a lot of ground for one evening, noting early in her set that they’d try to touch on several eras from her storied thirty-year career. Though she mixed in so many fan-favorites like “My Sister” and “Nirvana” from the early ‘90s, she was sure to put some distance between then and now too. Tribute paid, and pigeonhole avoided.